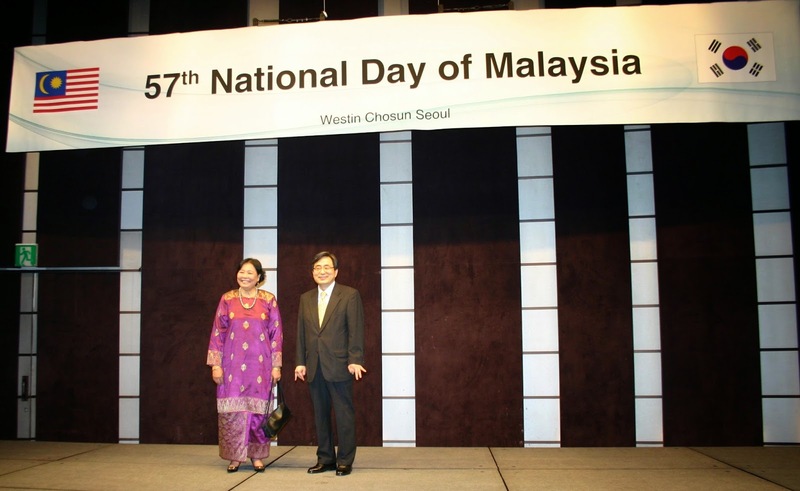 On September 3, 2014, 57th National Day of Malaysia held in downtown Seoul, at Westin Chuson Hotel. 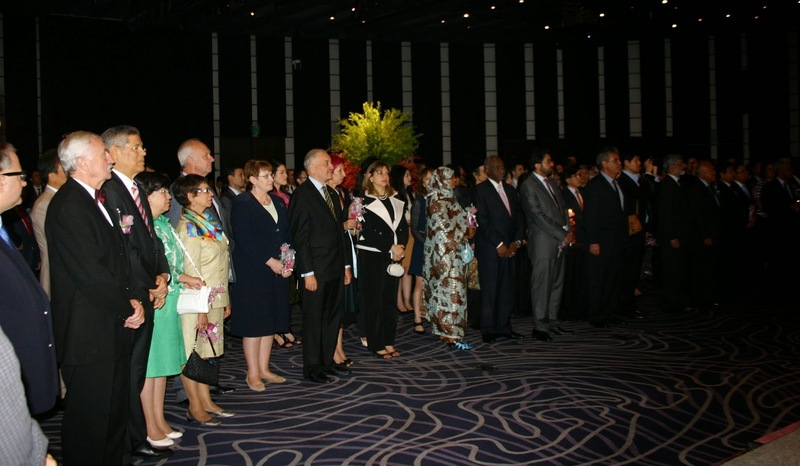 Approximately hundreds of invitees, diplomate community, are attended at the ceremony. 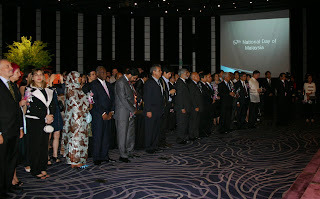 Among them are Mr. Shin Dong-ik, Deputy Minister for Multilateral and Global Affairs, Ministry of Foreign Affairs, Republic of Korea, Honourable Lawmakers, His Excellency Dato Haji Harun Ismail, Dean of the Diplomatic Corps, Distinguish guest, Excellencies and other. The event speech was delivered by Her Excellency Dato Rohana Ramli, ambassador of Malaysia, and followed by special speech of Shin Dong-ik from South Korea. Ladies and Gentlemen, Assalamualaikum Warahmatullahi Wabarakatuh. Selamat Petang/Good Evening. 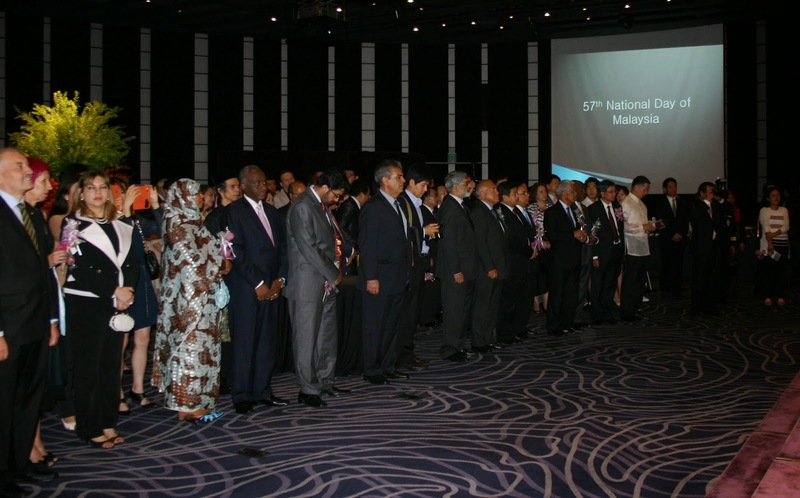 Before I begin my remarks, may I invite all of you to join me for a moment of silence in respect of those who had lost their lives in tragic incidents this year both in the Republic of Korea and Malaysia, i.e. the Sewol ferry incident, the missing of MH370 and slightly over a month ago the tragic incident of MH17. Our thoughts and prayers are with their families and loved ones. 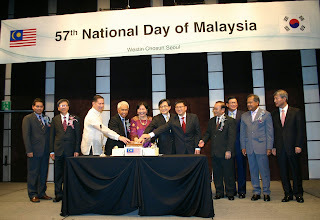 On 31st of August this year, Malaysia had reached its 57th year of independence. AlhamdulIilah, with the Grace of Allah, Malaysia is able to celebrate today its National day as an independent, sovereign, democratic, peaceful and harmonious country. I would like to thank everyone for making the time to attend this auspicious occasion. This is my first national day reception in Seoul since I took office end of last year and I am truly honoured to have your presence this evening. 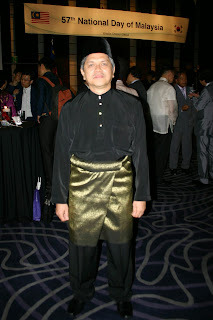 Malaysia’s journey as a nation from the beginning until today has been colourful indeed from all perspectives. In its early days of formation, Malaysia was basically an agricultural nation. Over the years, it has transformed itself into a trading and industrial nation. Malaysia also realized that it cannot solely depend on its domestic market for its economy and development. The reason being, realistically, as a nation of about 29 million people, Malaysia’s domestic market is not huge. Hence, becoming a trading and industrial nation is the most logical and beneficial way to create national wealth. After 57 years, Malaysia has largely reaps the benefits of the various policies and strategies sown. Obviously it was not a smooth journey. There were a few challenges encountered such as the Asian financial crisis. Nonetheless, Malaysia, like many other countries in the region, survived the crisis. Now, Malaysia is steadfast and working hard to make its Vision 2020 in becoming a develop nation a reality. In our quest to create national wealth, Malaysia is thankful that we have made many friends. I must emphasize that these are not friends in names only but true friends in time of need. These are friends who had provided support and assisted Malaysia when it has to cope with the two tragic incidents this year. I am of the view that one of the many lessons learnt from the two tragic incidents that Malaysia encountered was the importance of bilateral relations between nations. The Republic of Korea’s participation in the search for MH370 will never be forgotten by the Government and people of Malaysia. The strong bilateral relations between Malaysia and the Republic of Korea had made this possible. The diplomatic relations which, was established in 1960 have gained so much traction over the past 50 years and thus far, from our perspective, there have been no hiccups whatsoever. It is our hope that the current state of bilateral relations continues to remain strong and would be further enhanced and deepened with more substantive cooperation. 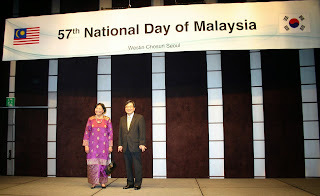 Malaysia finds Korea’s achievements in many areas, particularly its economic development, amazing. Malaysia introduced the Look East Policy in 1982 to learn from Korea. This policy has shown many benefits as such it has been reintroduced. It is now known as the Second Wave of the Look East Policy (LEP). The difference from the first wave is in its focus. The Second Wave of LEP will develop more targeted programmes with specific outcomes to contribute towards Malaysia’s pursuit of becoming a high income country by year 2020. I would like now to mention briefly on trade, investment, tourism and education. 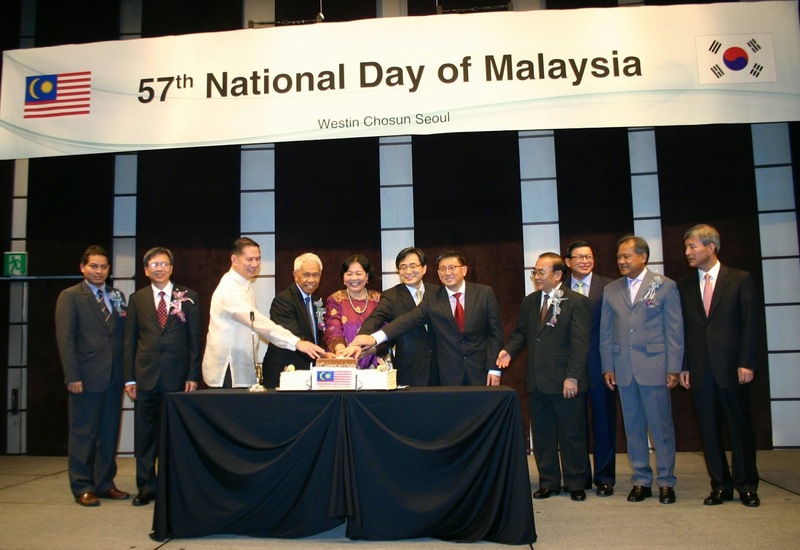 In 2013, Republic of Korea was Malaysia’s 7th trading partner, 9th export destination and 7th import source. The Republic of Korea is also one of Malaysia’s main sources of foreign direct investment since 1980. In terms of investments, the Republic of Korea was the second largest foreign investor in the manufacturing sector for 2013. The investments were valued USD1.7 billion in 13 projects. In terms of investment, Malaysia host more than 300 Korean companies, including many top conglomerates in the manufacturing sector and selected services sector including those that have established their regional operations in Malaysia, with investment more than USD4.0 billion. Malaysia welcomes more investments from Korea, particularly in new growth areas in high technology, high value-added, knowledge-based and skills-intensive industries. Malaysia and the Republic of Korea have also been enjoying healthy numbers of tourist arrivals each year. There were 207,727 Malaysians who visited Korea in 2013. Meanwhile, as for the Koreans visiting Malaysia, it was recorded that approximately 274,622 Korean tourists visited Malaysia in 2013. As this year is Malaysia’s Visit Year, we hope the number of Korean visitors will exceed last year statistics. Besides trade and investment, Malaysia and the Republic of Korea bilateral relations have expanded into cooperation in other areas such as education. There are many Malaysians students studying in the various Universities in Korea. Koreans parents also are sending their children to study in the various international schools and higher institutions in Malaysia, taking advantage of the cost involved as well as the fact that Malaysia is only six (6) and half hour by flight away from Seoul. In closing, may I now invite all present to join me in a toast: to the wellbeing and prosperity of the people of the Republic of Korea and Malaysia, as well as to the continued strong friendship between Malaysia and the Republic of Korea. CHEERS… Terima kasih, Kamsa Hamnida, Thank you. The Asian Human Rights Commission (AHRC) is gravely concerned to have learned that Professor Worachet Pakeerut, an associate professor in the Faculty of Law at Thammasat University, leader of the Khana Nitirat, and human rights defender (HRD), has been charged in the Bangkok Military Court with violating an order of the National Council for Peace and Order (NCPO). This is a clear instance of targeting an HRD for his ideas and actions in support of human rights. At the time of this statement, the AHRC is awaiting news of whether or not Professor Worachet will be granted bail. The Khana Nitirat, or as they are called in English, the "Enlightened Jurists," is a group of seven law lecturers at Thammasat University who have carried out academic work and advocacy in the service of expanding knowledge about rights and law in Thailand since 2009. They have courageously raised urgent questions about who has access to human rights in Thailand, and whose rights are routinely denied as a matter of rule and course. Of particular significance, their statements, articles, and seminars aim to make law accessible to the people, rather than only a tool of a narrow network of experts. The work of the Khana Nitirat has unsettled state, military, and other elites from its inception, and the members have frequently been targets of online and other threats. In February 2012, Professor Worachet was physically assaulted outside his office at Thammasat University by two young men who later admitted that they assaulted him because they disagreed with his ideas (AHRC-STM-040-2012). Since the first days after the coup was launched on 22 May 2014, the NCPO has explicitly targeted academics, human rights defenders, journalists, artists, and dissident thinkers. Professor Worachet Pakeerut has been among those targeted by the junta since the beginning. He was included on the list of persons named in Order No. 5/2557  on 23 May, which was broadcast on the radio and television and demanded that those named themselves to the Army Club on auditorium at Thewet Road by 4 pm on 24 May. Several weeks later, he was named again in Order No. 57/2557  on 9 June which was broadcast on the radio and television and demanded that those named themselves to the Army Club on auditorium at Thewet Road by 4 pm on 10 June. 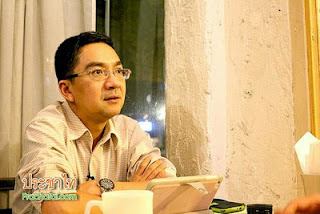 According to information provided by Prachatai, Professor Worachet's wife reported to the junta at the Army Club on Thewet Road on 11 June that her husband was unwell and unable to report himself at that time. Subsequently, Professor Worachet reported himself to the junta at the Army Club on Thewet Road on the afternoon of Monday, 16 June. He was taken into custody after he reported himself to the junta. He was then detained overnight at the base of the 11th Regiment King's Guards in Bangkok and taken the next morning back to the Army Club. On the morning of Tuesday, 18 June, he was sent to the Crime Suppression Division for further investigation. On the afternoon of 18 June, he was sent to the Bangkok Military Court to be formally charged with violating an order of the NCPO. The penalty for violating an order of the NCPO carries a maximum prison term of two years and a 40,000 baht fine. The AHRC is particularly concerned that Professor Worachet will be processed in a military court under the Constitution of Military Courts Act B.E. 2498 . In the past two weeks, several other HRDs, including Jittra Kotchadet, a labour activist and HRD, have also been charged in military court in relation to being summoned to report by the junta (AHRC-STM-109-2014). In an open letter to the United Nations Special Procedure mandate holders on 2 June 2014 (AHRC-OLT-006-2014), the AHRC detailed the particular potential rights violations possible during military court processes. The use of military courts is a clear derogation of Thailand's responsibilities as a state party to the International Covenant on Civil and Political Rights. While the junta has claimed, through the use of martial law, that the current social and political situation represents a public emergency in which the derogation of responsibilities is permitted, the AHRC's assessment is that no such situation exists to justify the establishment of these courts in Thailand at this time. Despite the country's ongoing political unrest, much of which dates to the prior coup in September 2006, it is beholden on the civilian authorities to deal with that unrest in accordance with ordinary procedures. Despite the assurances of authorities that they will respect human rights, the consistent experience in Thailand has been that where special laws have been used, people affected by the laws have encountered a corresponding increase in cases of arbitrary detention, torture and denial of due process rights. Nothing in the present circumstances offers reassurances that the same will not occur through the establishment of military courts under martial law. The Asian Human Rights Commission unequivocally condemns the coup in the strongest terms and wishes to express grave concern about the rapid decline of human rights protections it has engendered. The AHRC calls on the NCPO to immediately release all citizens being arbitrarily detained without charge and to cease creating public terror by issuing blanket summons to report to the military. The legal processes against Professor Worachet and all other civilians in military courts are illegitimate and all charges should be immediately dropped, and anyone currently being detained in relation to charges in the military court should be released. Further, the AHRC calls on the NCPO to recognize that tolerance for different ideas and dissent are part of building a polity grounded in human rights and the rule of law. To think differently than the junta is not a crime. 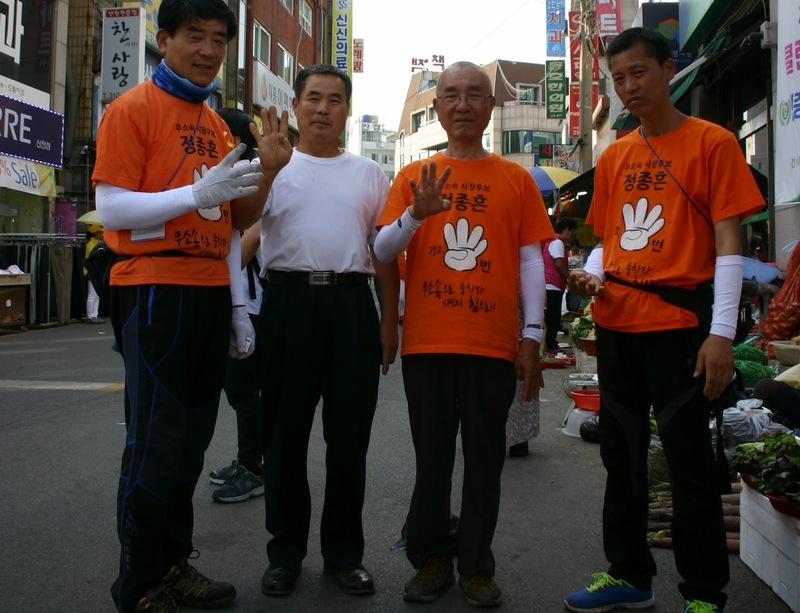 Mayor Jeong Jong-heun is seeking for June 2014 Sihueng City Mayor election. His aim is to be a cleanse city, he is also initiated the cleansing of sea industrial complex during his mayor term. During his time as mayor when an environmental issue was raised he was the first person to respond and make developments for a green city. In particular, he developed Yeonseong area with full of lotus flowers, and clean stream bank which flows from the Murang Lake into the Sore port at the western sea. Sihueng city is one of the biggest industrial zones in the country and has a large number of migrant workers. There are at least ten thousand migrants resident in the area. 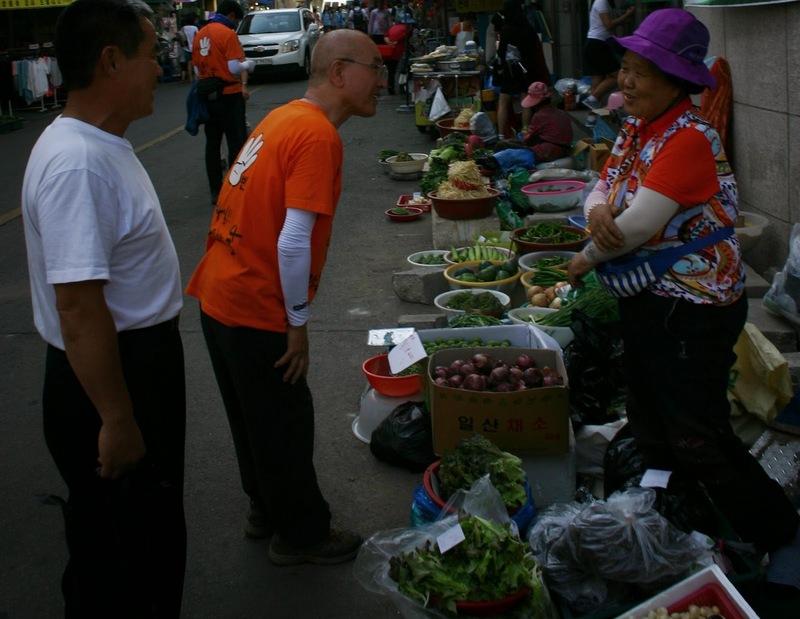 To alleviate their plight and support the needs of the migrant workers, Mr. Jeong inaugurated the first foreigners’ family welfare center in Sihueng city in 2005. He is looking forward to the city’s future as a multicultural city. Mayor Jeong Jong-heun was born in Geochang, Gyeongsannam-do Province in 1943 in a typical giwajip style Korean house. A hometown, with the spirit of Gibaegsan, and the river of Wicheon full of water, and with a wide range of plain farm land, made him a man. He graduated with a BA degree in Russian language from the Korea Foreign Language University in 1966, and a double MA in Administration and National Policy from the Seoul National University in 1979 and 2004 respectively. He served as Sihueng city mayor from 2002 to 2006. Before that, he was a vice mayor of Sihueng City from 1998 to 2000, and Chief of Gapyeongkun Administration from 1992 to 1994, as well as, Chief of Incheokun Administration in 1994 and he also served as a captain in the Military Air Force from 1966 to 1972. He received several awards for his hard work, including Air force Award for Saemaeul Movement, Pink-heart Merit award, Presidential Award and Nationwide Award(Shimin Newspapers). Furthermore, he has actively advocated for social and environment issues. He is involved in the pro-environment Biologic Park Construction from Murang stream to Wolgot Port, and the Theme Yeongot Park construction, and has campaigned for a green city free from air pollution in Jeongwandong. 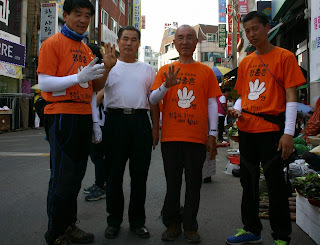 Since retiring he is now an advocate for Korea-Dokdo-love. He is an adviser and Honorary Chairman of the Global Friendship Club. Right now, he is living with his two sons and climbs mountains in his free time. PARIS, 7 May 2014 (Vietnam Committee) – As Vietnam hosts celebrations of the United Nations Day of the Vesak (Birth, Enlightenment and Passing away of the Buddha) at the Bai Dinh Temple in Ninh Binh from 7-11 May, sixty one prominent international personalities have launched a joint appeal to the Vietnamese leadership to cease repression against the banned Unified Buddhist Church of Vietnam and release its Supreme Patriarch Thich Quang Do. 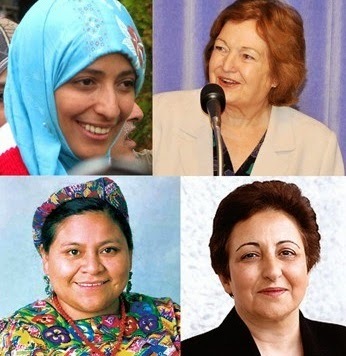 The signatories include four women Nobel Peace Prize laureates, Mairead Maguire, Shirin Ebadi, Rigoberta Menchu Tum and Tawakkol Karman, Roman Catholic Bishop Vaclav Maly of Prague, US Congress members Frank Wolf, Chris Smith, Loretta Sanchez and Zoe Lofgren, former Canadian Prime Minister Kim Campbell, Vice-President of the European Parliament Edward McMillan-Scott and prominent MEPs from the UK, Italy, Portugal, Spain and France, Lord David Alton and Lord Eric Avebury (UK House of Lords), Emma Bonino, former Foreign Minister (Italy), David Kilgour, former Minister (Canada), laureates of the Norwegian Rafto Prize from Estonia, Hungary, South Africa, Mexico, Democratic Republic of the Congo, Azerbaijan, Nigeria and Bahrain, as well as civil society leaders from the USA, Europe, Burma, Mongolia, Taiwan, Tibet and Japan. In their joint letter to Vietnamese government and Communist Party, the 61 international personalities expressed concern at the stark contrast between the grandiose celebration of Buddhism’s most sacred festival and the renewed intensity of State repression against Buddhists in Vietnam. “We are deeply disturbed by recent reports of grave repression against Buddhism, the very faith you claim to celebrate”, they wrote, noting that “UBCV monks, nuns and lay-followers all over the country are routinely harassed, and Security Police are preventing Vesak celebrations in UBCV temples in Danang, Hue and elsewhere”. Only the State-sponsored Vietnam Buddhist Sangha is involved in the ceremonies, whereas UBCV leaders remain “prisoners in their own pagodas”. They urged Vietnam to celebrate Vesak more meaningfully by releasing Supreme Patriarch Thich Quang Do, 86, who has spent the past three decades in detention, re-establishing the legitimate status of the banned UBCV and ceasing all repression against the UBCV. (Full text below). From 7-11 May 2014, your government will host the 2014 United Nations’ Day of the Vesak at the Bai Dinh Temple in Ninh Binh province. This sacred festival, which commemorates the Buddha’s Birth, Enlightenment and Passing Away, is a world-recognized religious and cultural event. It should be a joyful occasion, a day to remember Buddha’s message of tolerance and peace, and to inspire all people, Buddhists and non-Buddhists alike, to work together towards mutual understanding and harmonious coexistence in our world. However, we are deeply disturbed by recent reports of grave repression against Buddhism, the very faith you claim to celebrate. Only the State-sponsored Vietnam Buddhist Sangha, controlled by the Communist Party’s Fatherland Front, is involved in these celebrations, whilst the independent, historical Unified Buddhist Church of Vietnam (UBCV) remains banned and its leaders are prisoners in their own pagodas. Today, the UBCV’s Supreme Patriarch Thich Quang Do, aged 86, a renowned scholar and 2014 Nobel Peace Prize nominee, is under house arrest at the Thanh Minh Zen Monastery in Ho Chi Minh City. He has spent more than three decades in detention for his peaceful advocacy of religious freedom and human rights. UBCV monks, nuns and lay-followers in twenty provincial sections all over the country are routinely harassed, and Security Police are preventing Vesak celebrations in UBCV temples in Danang, Hue and elsewhere. In the light of these grave abuses against Buddhists, as well as Catholics, Protestants, Hoa Hao, Cao Dai and other religious communities, the US Commission on International Religious Freedom recommended in its 2014 report that Vietnam be re-designated as a “Country of Particular Concern”. We appreciate the progress Vietnam has made in the economic domain, but we believe that progress is only sustainable if it is built upon tolerance and respect. Vietnam is a member of the UN Human Rights Council and a signatory to key UN human rights treaties. As such, your government has a binding obligation to uphold human rights, including the universal and inalienable right to freedom of thought, conscience, religion or belief. We, the undersigned, call upon you to mark this 2014 UN Day of the Vesak by ceasing all repression against the UBCV, releasing Supreme Patriarch Thich Quang Do and restoring the UBCV’s legitimate status. By this gesture, you will uphold the noble aims enshrined in the UN Vesak Day Charter, and honour the 2,000 year heritage of Buddhism in Vietnam. ANSAN, South Korea - A greatly developed nation is governed by a great leader who has the brains, heart, soul, competency, vision and values. For instance, Singapore, Malaysia and other Southeast Asian nations have proven growth for having tough leaders who made their people proud with their competent rulers and countries alike. They are fear to corrupt the taxpayers' money and by surely generating the wealth of the nation to infrastructures such as roads, bridges, electrical grids, telecommunications and many other components for people's interest and the welfare of the nation's citizenry. South Korea on the other hand, a nation from East Asia has become the most advanced and industrialized nowadays for having great leader and less-corrupt government and also has become the economic tiger in Asia and tagged as one of the world's fastest growing economy since 1960s to 2000s upward. Worse, the Philippines today was being marked as a “Failed State,” by a fearless, iron lady, brilliant and veteran Senator, Miriam Santiago, who strongly condemned and criticized the corrupt and accused lawmakers as thieves of nation's treasure and murderous as well to mediamen, whistleblowers and rival politicians. Moreover, being tagged as “Gates of Hell” by other group of netizens in popular social sites, expressed strong sentiments the past and present leaders involving incompetent and irresponsible senators and congressmen and other public officials which caused the nation in chaos. By doing so, it is still one of the poor and developing nations until today due to massive corruption from local up to national level of government, bribery, unstoppable increase of basic commodities, power and electricity rate hike (Asia's highest), drugs lords and rice smugglers haven and unstoppable killings of journalists. Recent reports showed, there were 26 media practitioners killed in the regime of President Aquino since he was elected in 2010. Our nation today has really one hope, the man or the Pride of the nation who came from ragged condition and became one of the highest paid boxers in the world today and a certified rich and famous and a bilionaire. Manny's name had become well known and a present world champion. 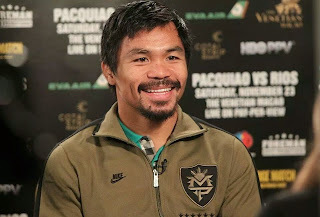 Manny Pacquiao greatly ” brought home the bacon” the Crown and Joy to the Filipino nation, he is the good ambassador in sports and a “National Treasure” of the land. Furthermore, everytime he fights in the ring, all his countrymen are quite excited by supporting his fight worlwide and thus called as the man of courage and humility, he is like a roaring tiger fighting with the opponent inside the arena, whenever he is outside the ring he becomes a friend and favorite to all people who truly like him , like the former and current boxing champions, singers, action stars, NBA players, boxing experts, commentators and analysts, as they tremendously say and agree with each other that Manny Pacquiao is a very humble person and a great champion. To Filipino fans, he has been a great pattern to his countrymen and a good friend to everyone including the famous celebrities around the world. 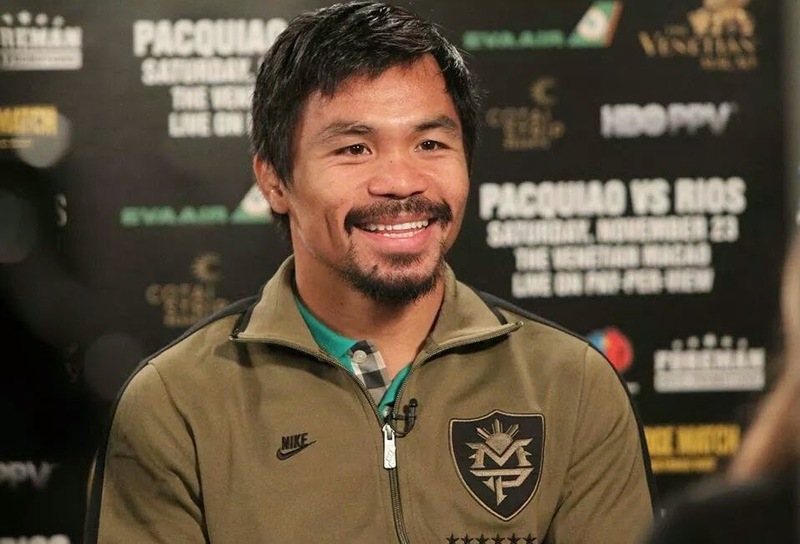 Manny Pacquiao or Pacman to his universal fans, is presently a congressman in Saranggani Province. “Manny is very humble person”, one famous mexican trainer said. However, Lennox Lewis, a heaveweight champion said Manny is not a dirty boxer and he is so tough inside the ring. “He has a good future in Politics and a good politician in his land”, Bill Clinton said, a former president of America. “We have peace in the world if there is Manny in every division,” Larry Merchant said, the greatest boxing Analyst of HBO. He is a certified philantropist because he shares his own money and time to the needy and poor neighbors in his province and the most affected typhoon victims in Leyte province. Hence, he is not contented only to be a boxing champion but also he is more than willing to serve his fellow countrymen, the unfortunates and poor Filipinos by extending a helping hand thus he was elected in 2010 and another in 2013. Pacquiao, on the other hand, has big plans to run for higher office and willing to help the less-privileged people despite criticism from few people and political rivals. He is more competent and better than the present political leaders we have today. If our selfish and heartless leaders cannot knock the growing poverty out of the country, he can readily and easily knock it out as he is willing to serve for the sake of the poor and showing more faith in his Almighty God, who always gave victory and strength to him. Meanwhile, the absence of capital punishment in the country made shameless and corrupt public servants and abusive lawmakers continue pickpocketing their annual Priority Develpment Accelerated Fund (PDAF) or known as Pork Barrel and ended into scam. These funds had not been distributed to designated beneficiaries like farmers, and other helpless people in different non-government organizations (NGOs) but went only to bogus and fake beneficiaries. This is the main reason why the nation of Filipinos has ben tagged as “Failed State”, it has also included some shame for having the worst airport in the world, the 3rd most dangerous nation in the world for journalists and the highest electricity rate in Asia that investors are hesistant to come and invest and also it has the slowest internet connection in Asia. Saranggani province representative Manny Pacquiao, one of the most loved athletes in the world has brought the Hope, Joy and Crown to every hopeless Filipino that our elected and worthless political leaders have not but shame and disgrace anf becoming richer year by year according to their Statement of Assets and Liabilities account while the poor people become more poorer and even the country's poverty has elevated and joblessness is getting higher for lack of good governance, politickings, dishonesty, incompetence and most of all the rampant and endless graft and corruption in many govenment agencies. More importantly, Manny Paquiao believes that there is a greatest God in the world who will use the “Filipino Pride ”to be a great pattern for saving the nation from hopelessness and devastation from the hands of worthless and dishonest leaders and putting these selfish people in shame and disgrace like what happened to former and corrupt president Gloria Arroyo and her cohorts. God, the King of kings of all nations will put a good person to be a good paradigm for the sake of the majority people who are in great sufferings now and the “People's Champ” will be a good example to every Filipino especially the poorest in society, who at this time is hopeless and desperate with the incompetent public officials of the present administration and in the very end all traitors, thieves, murderers, plunderers of the nation will not go unpunished. According to the latest reports or survey in the first quarter of the year 2014, about 11.5 million Filipino households are poor or 53 percent of the respondents see themselves suffering in poverty or shortage of food due to home expenses are higher than their minimum income. Noticeably, minimum wage worsens poverty, and study says, instead of uplifting the lives of poor household families, mininum wage prevents them to find from finding a job and caused to a lower household income. The Filipinos need a complete change. Many citizens blame ignorant voters voting ignorant leaders in higher office. One concerned citizen expresses that the present govenment makes the nation in bad situation where the people and nation had become exacerbating due to politics, lies and cheats. Presently, majority of Filipino people, group of netizens in social media and Filipino abroad are very disappointed with the present conditions of our nation and calling for a total change, including the persecution or punishment of corrupt and plunderers by putting them in jail until proven guilty. As a matter of fact, Majority of the people are saying to elect in 2016 presidential election Davao City Mayor Rodrigo Duterte and Senator Miriam Santiago as the most deserving candidates with meritorious performance, worthy and competent public servants. Congressman Manny Pacquiao is definitely one of the best choices and HOPES if one of the two distinguished candidates refuses to run. Many Filipino people can say that Philippines will rise again.